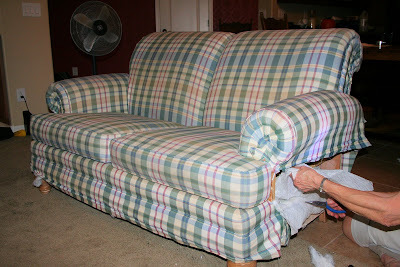 The Loveseat–from plaid to rad! Well, mostly before–we had already begun demolition. 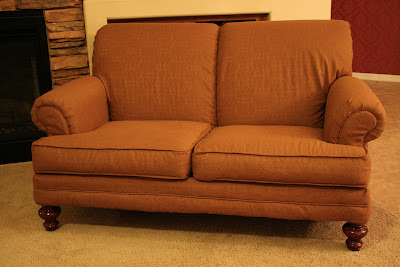 This Broyhill loveseat was quite the nice piece of furniture in 1994, when it was made. I got it from my friend when she was moving for $15. The plaid (besides being a little dated, and worn/torn in places) just wasn’t working in my home. Last time my mom came to town, we got the materials for this project, but were busy slipcovering my hide-a-bed couch, so she had to come back to do this one. The hardest part is taking the thing apart. (Even with all of these fantastic helpers!) The staples were smaller than Mom was used to seeing, and broke easily when we tried to pull them out. There must have been a million of them. We all worked for a couple of days, getting staples out. As we got the various pieces off, Mom would write down the order in which they came off and label the fabric pieces, with a sharpie, as to their location on the couch. Those pieces became the pattern for sewing the new pieces. I’ve had a hard time getting decent lighting to take these pictures and had to take these at night, so the first is without a flash and the second is with a flash. I think reality is somewhere between the two. I think the fabric is called “tobacco,” and that is probably the best way to describe the color. It has a nice subtle textured pattern throughout. And it really makes me want to finish the rest of the unfinished projects in my family room that are now sticking out like the sore thumb the couch used to be. If you like this post, please consider making a donation of any size to the Farnsworth and/or Blaser families as part of my “Big-Hearted Holiday” Project. Thanks! WOW! That turned out great! I am so jealous that your mom can reupholster!!! Looks very nice! You (and mom!) did a great job! I want a how-to! I have A LOT of Thrift Store (free) furniture in my home that I would love to have MATCH each other! It is beautiful – I am really impressed Kendra! What a big project and it turned out so well! wow, that seams like it was a huge undertaking – love the way it turned out! Oh my this is really good! I'm impressed! i hadn't visited your blog in forever. been a blog stalker slacker. 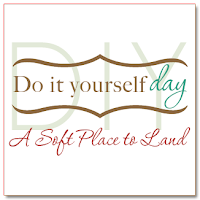 . .
anyways, i dreamed last night that i was sitting in my van with the boys waiting on my husband to do something. . .get something from the grocery store or something, and i dreamed you came up to my van with a flyer advertising your blog? i was like…….i read your blog already? how weird is that??? anyways, maybe god was telling me i needed to read something over here? i'm going to leave it up and sign off in a little while and see what i've missed!! have a great day!!!!!! WOW! 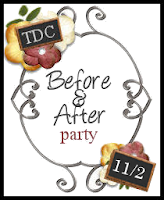 What a great before and after! I love how it turned out! Thanks for all of your kind words! I am lucky my mom can do this, but mostly she can do it because she isn't afraid to try (and she has wicked skills on the sewing machine). Laura, as for the how-to, I can see if I can get her to write something up, but basically, I know that you just start taking things apart carefully, keeping track of the order in which they came off so you can put them back on in reverse order. Cut pieces from the new fabric, using the old fabric as a pattern. My mom often reuses the cording and things from the old piece. I would recommend starting with dining room chairs or benches–something that requires less sewing, to get some confidence. That is amazing. Quite the transformation. it turned out gorgeous! what a nice mom you have!!!! 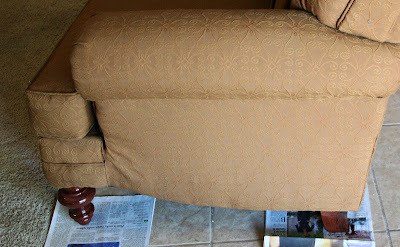 Holey sofa cover… that looks like you totally bought it that way! True top notch kind of cover. Your Mom did a fantastic job! It looks totally renewed! Maybe you can send her my way? Huge change! Made a big difference. Wow! What a great idea to save the fabric pieces to use as a pattern. I'll do a slipcover, but uholstery is an entirely different creature to tackle. Well done! Wow, it is just beautiful now! Very impressive that you guys did that yourself! It turned out great! 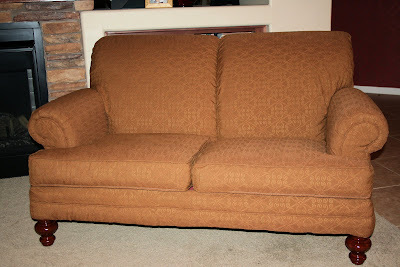 You are so lucky to have a handy dandy mother who will come over and basically give you a new couch. It sure is a big improvement. My mom worked in furniture design/production for years. She's amazing with slipcovers/upholstry, too. Lucky us, right? That's fabulous…like a brand-new loveseat! My sister can do that kind of things, but I'm a little nervous/lazy to tackle a project that big. All I can say is "WOW!" Great job!